In the days after Sandy hit our island and the surrounding mainland, our congregants tried to determine how their homes had fared. Some of them found their homes secure and with little damage, others were faced with daunting task of restoring their homes and businesses. For many of our members, their second concern was for the new JCC of LBI building. They saw the email sent out of the side of the building with the water up to the top of the mailbox (see below). Once back onto the island, we were able to report that, except for exterior cleanup, the building came through the storm unscathed. Where was everyone? How were their homes? News about when we could get back on the island, where help could be found for restoration and cleanup and other important information was sent out to members by the JCC email several times a week. We were able to at least stay connected electronically. In the weeks that followed, residents began to return to their homes to start the cleanup. Many had stayed at friends or relatives, or in shelters and motels. It was a fretful time. Houses were off their foundations and there was sand – sometimes many feet high – everywhere. Along the streets, sidewalks were filled with black garbage bags, mattresses, couches, wall board, insulation, and other debris. In the days that followed, many volunteers from around the country offered their help. A group of volunteers from the Ocean County and Greater MetroWest Jewish Federation came to the island with rakes and brooms to help restore the grounds around the synagogue and cleanup the debris in the garage of the rabbi’s residence. Now that our building was secure, the doors of the JCC of LBI were opened one weekend to welcome the many volunteers who came from Pennsylvania, Delaware and Northern New Jersey to help clean up our island. Over 100 people enjoyed a warm place to rest, food to fill their empty stomachs and a place to freshen up. On November 30th, five weeks after the storm, we held our first Friday night Shabbat Service. It was quite a reunion. The following week, the office returned to the building from its temporary site on the mainland and on December 9th, Chanukah was celebrated with latkes, gift exchanges and the lighting of menorahs. We were back in business. Ten weeks after Sandy, there are some signs of progress on the island. The debris on the curb for the most part has been picked up but if you look at the windows of many of the homes, you will see that they are empty, stripped down to the studs. Businesses are beginning to re-open, but on the boulevard in Beach Haven, the stores and restaurants are empty, waiting to be restored. We do not know what future holds for our island and surrounding bay communities. Perhaps the story of one of our members is an example of the spirit of this special place. Rosie is 93 years old, an active member of the congregation and Sisterhood Treasurer. Her cottage, where many of us have gathered over the years for holiday meals, was heavily damaged in the storm. All of her possessions sat outside of her home in a wet heap (they were able to save the Sisterhood records, something that was of great concern to her). We were all worried that she would not be able to return to LBI from California where she spends her winters. Rosie made it clear this is her home and that she would, with the help of her family, move into her renovated home in the late Spring. She is busy picking out mattresses and furniture and is excited about enjoying her new home on this island she loves. She is our inspiration. We know we have a tough road ahead but as it always has, our community will work together to rebuild our homes and businesses and once again to enjoy the beauty of our surroundings. 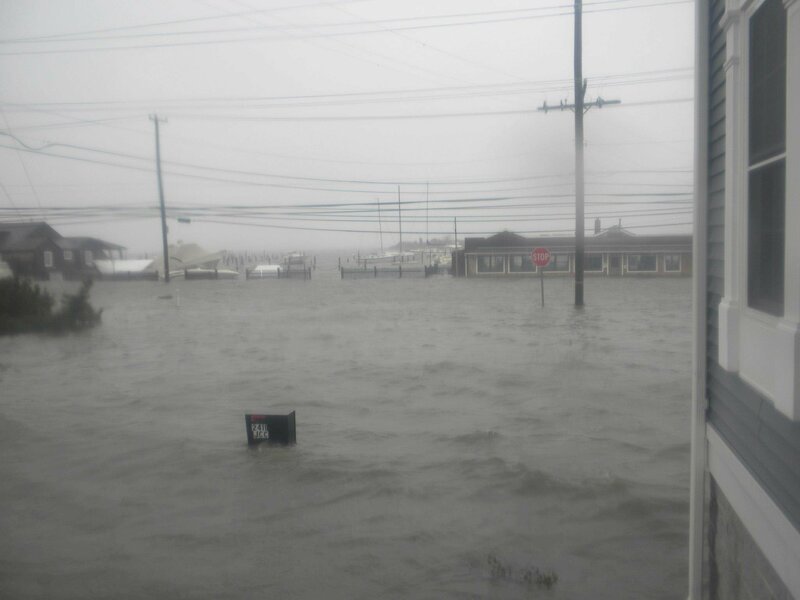 Looking west from the JCC Building with the Bayside dinner in the background and our mailbox just about covered.